…with an Eco Max Pet Brush. Regular grooming is recommended to combat dandruff in pets, but the right brush is important. A brush that’s too soft will not be effective, and a brush that’s too hard can irritate the skin further. 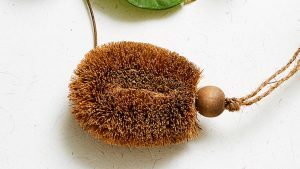 The rounded ends of a natural fibre Pet Brush are soft enough for your pet’s sensitive skin while being firm enough to remove the excess skin cells, dirt and other contaminants that can cause irritation. Regular gentle brushing will also stimulate the skin, increasing blood flow and reducing the inflammation that causes itching. – Regular brushing will help to keep your pet’s coat healthy and shiny by removing loose hairs and evenly distributing natural oils. – In long-haired pets it will keep your pet’s coat tidy and prevent tangled knots that are uncomfortable and lead to health problems. – It will give you a chance to check your pet for fleas, ticks and other nasties. – Brushing will make your pet feel good – consider it a massage for your pet. – Regular brushing is also an opportunity for you to bond with your pet – it will make you feel good too! Not only will you be keeping your furry friend happy and healthy, you’ll be doing the environment a favour too: Eco Max Pet Brushes are Vegan, Fair Trade and biodegradable. They’re handmade from coconut fibre, a sustainable vegetable fibre which has natural anti-bacterial properties, so they won’t become smelly or mouldy. This means that Pet Brushes can also be used wet to apply shampoo while washing your pet. Eco Max Pet Brushes come in both Large and Small, so you’ll find a Pet Brush to suit your flaky fur friend, no matter their size. Eco Max Pet Brush is handmade from natural coconut fibre a sustainable vegetable fibre which has a natural anti-bacterial so won’t become smelly or mouldy making it an ideal pet brush. It can be used wet to help spread the shampoo throughout the coat while washing and then dry to brush out dirt, sand, dry skin cells and loose hairs. The rounded ends of a natural fibre brush mean that it is soft enough for your pet’s sensitive skin. Eco Max Brushes are Vegan, Fair Trade and biodegradable. Care of your brush: Rinse and place in your dish rack to dry. Compost at the end of their life.